Household systems and appliances are a large part of our daily routine. Whether we realize it or not, we spend a lot of time using those features in our home that make it functional to live in. It's easy to take for granted the water heater in your basement that provides you with steaming hot showers during the cold Ohio winter. Without the systems and appliances in homes, our lives get harder. Busy homeowners don't have time to worry about replacing entire systems and appliances before the entire family starts complaining. Knowing your systems and appliance's average lifespan and average replacement cost will prevent the inconvenient disruption in your daily life when one of them decides to stop working. Let's plan ahead! *Disclaimer: Each appliance is subject to a lower or higher price than the national average cost due to several different implications and options given to homeowners in regards to each appliance. The following information assumes the system or appliance is taken good care of and undergoes routine maintenance checks. The following replacement cost includes labor cost. Dishwashers are one of the cheaper appliances to replace. The labor can become more expensive than the unit itself due to a dishwashers location in the kitchen around cabinets and below countertops. 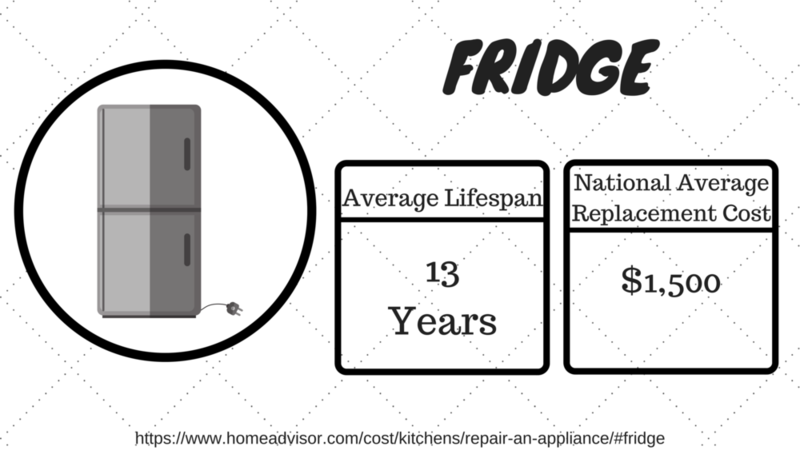 Although microwaves are on the lower end of the lifespan spectrum, the cost to replace the unit is cheaper than most other appliances. This appliance is one that homeowners can live without for a few weeks if it happened to stop working. With this average lifespan for washers and dryers, the washing machine is known to need replacement before the dryer. Be sure to contract a professional before assuming the entire system needs replaced. Often time parts and pieces of the washer or dryer can become faulty, but those issues can simply be repaired. Please take note: the price of washers and dryers varies depending on the homeowners particular wants and needs. As you can see, the average lifespan for a water heater is highly dependent on if your tank is gas or electric. Electric water heaters can have a much longer lifespan than gas, but they can also have the same lifespan between year 10 and year 12. The only time your water heater will need to be replaced is when the tank completely fails. Otherwise, select parts can be replaced and regular maintenance on your water heater can lengthen the tank's life span. This is another appliance with a dependent cost on the wants and needs of the homeowner. Some homeowners need a water dispenser built into the fridge and others prefer the freezer drawer at the bottom of the fridge. 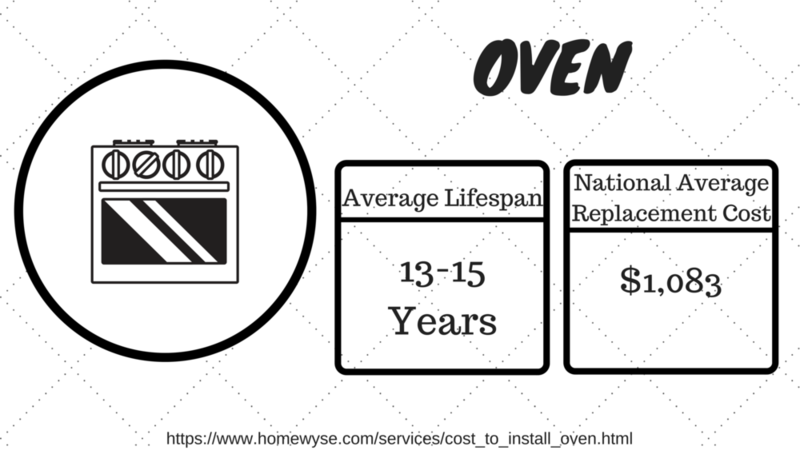 Ovens more commonly see maintenance repairs than entire units being replaced. These repairs usually cost a few hundred dollars. Common repairs include a faulty ignitor, temperature sensor, calibrator and burnt out heating element,. 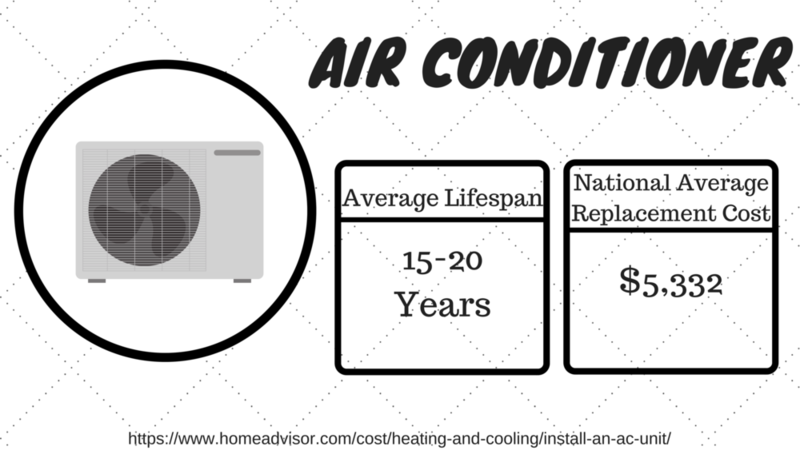 The cost of this system is dependent upon the type of air system and circulation in your house. The air conditioning system options are window units, split system, central system and portable units. A contractor is able to tell you which unit your home needs if you are unsure. Air conditioners are also categorized by whole house or room by room circulation. The furnace installation price is included in this estimated average. Please note the cost of the furnace unit and installation is dependent on the type of furnace you are replacing. The most expensive to least expensive units are as follows: Oil, Gas, Electric. For homeowners who don't have kids playing Wall Ball against the garage door, it will typically last longer than most home ammenities. However, garage door openers don't last nearly as long with an average lifespan of 10-15 years. Several features like the type of material used for the new door can increase or decrease the price you pay. An appliance no one can afford to stop working is the toilet. Toilets are said to last a very long time, but they often have several problems during their lifespan. The more common problems are bad flappers and fill valves which a plumber can easily fix for under $200. From now on, you have to be surprised when your systems and appliances decide to stop working.